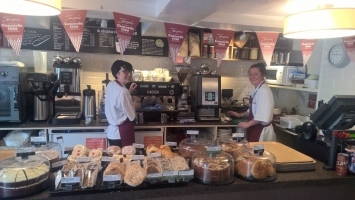 Local independent family owned company Jempson's has re-opened the doors of its Café opposite Battle Abbey following an extensive refurbishment. Phase one of the upgrade is complete, phase two will commence after Christmas. New furniture along with a brand-new servery, coupled with a complete re-decoration and store layout are some of the changes. The self-service offering has been improved both in range and convenience. A new ‘Meal-Deal' has been introduced that focuses on great local products from Jempson's ‘Local Hero' suppliers. Jempson's have also launched their own branded reusable coffee cup, which once purchased will offer customers 75p off every hot drink it is refilled with. The second phase of the refurbishment will include new customer washroom facilities along with a further 24 internal seats. Stephen Jempson said ‘Thank you to our customers for bearing with us during the refurbishment. We hope that they thoroughly enjoy their new look café, Sophie and her team look forward to welcoming you'. Jempson's are an independent family owned business with supermarkets, convenience stores, petrol station, post office counters, pharmacy and cafés in and around East Sussex, proudly serving the local community since 1935.